Winmate Handheld devices can be customized to address a very specific need– to provide a rugged and reliable wireless communication device for field services, and one such application is Sales Force Automation (SFA). Advancement in mobile technology allows SFA to replace traditional error-prone paper and pencil information recording and transmitting, with mobile devices that allow staff to place orders and have the order instantly recorded on portal site, for expedited and accurate review and order preparation to reduce shipping and delivery time. Coca-Cola sales force team in Sri Lanka is aiming to replace their traditional method of store to store sale management which involves counting the product inventory at each customer's store manually. With a new automation technology, the staffs can reduce mistakes during the inventory counting process, make their staffs easier to count the inventory, check the order status, and deliver accurate inventory count in the shortest amount of time for each store. 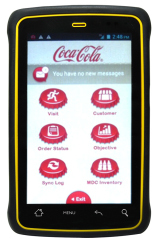 Before migrating to Winmate E430M2 with Android platform, Coca-Cola was using consumer phone which had limited capabilities. 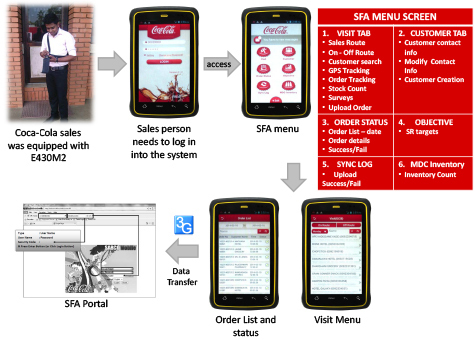 Each sales person will log in and access the Coca-Cola SFA menu, through this software, sales are able to access their account and check his order status or history. 1D Barcode reader is utilized for accurate inventory count on the customer site. After each inventory check, staff can place order on item on shortage, submit it to the SFA portal using 3G communication and move on to the next customer's store.